Drought is severely affecting crops, grazing land, and the livelihood of 12 million people living in east Africa. The Horn of Africa Drought Crisis map created by Esri tells a story of famine, conflict, and humanitarian aid. People have left their towns and villages to seek food, water, and medicine provided by nongovernmental organizations (NGO). The map's purpose is to raise people's awareness of these famine refugees and the organizations that serve them. Horn of Africa drought symbolized in red also indicates areas where famine is widespread. The map's operational layers include refugee camp locations and conflict area data provided by Famine Early Warning System (FEWS) as points and population density for Africa in 2000 provided by the United Nations Environment Programme as polygons. A layer of crowdsourced data from the NGO Bettermap project, as well as social media input from YouTube, Twitter, and Flickr, provide camp descriptions and video, commentary, and photos directly from these locations. The 2011 drought has caused a dramatic surge in the camps' populations. The operation layer provides static, decade-old population counts, while data in the social layer provides real-time information that confirms human migration. The refugee complex in Dadaab in Kenya's North Eastern Province has three camps that were built for a capacity of about 90,000 people. The operational layer reveals that the population of the area surrounding the complex in 2000 was about 40,000 people, which is dense, on a scale where a population of more than 50,000 people is rated overly crowded. The social data layer shows that in July 2011, the refugee camp reported a population of 525,674 people. Readers can readily infer the enormity of human migration and the strain on refugee services. Map details become more poignant to readers as they click icons to see pictures and videos of afflicted areas. By clicking a YouTube icon near Dadaab, one can listen to a story about the refugee complex told by Father Orobator, a priest working for Jesuit Refugee Service, and see photos of the camp. The video shows the camp's distribution center filled with sacks of flour and a woman walking from it with two sacks balanced on her head. Photos of grossly underweight children arriving at the center, as well as photos of children being taught in a refugee school, show the need and the mission of the camp. These postings change regularly to stay current. Clicking a black globe icon on the map opens a text box that describes the area, the need, who is afflicted and how, and which NGO is providing support to that area. One can also see that areas designated "conflict/at risk" have few human relief services, implying the massive movement across borders toward areas where relief is offered. Esri mapmakers worked with Esri Eastern Africa Ltd., Esri's distributor in Nairobi, as well as with FEWS. The Bettermap project is built on the Ushahidi platform that allows media mapmakers to gather and distribute data via short message service, e-mail, and the web and put it on a map or timeline. Esri has published a host of other media maps for important events, such as the unrest in Libya, floods caused by Hurricane Irene, and the Gulf of Mexico oil spill. People such as journalists can configure the basemap, layer visibility, and map extent; create social media settings; and then share their configured maps to tell their own stories about an event. 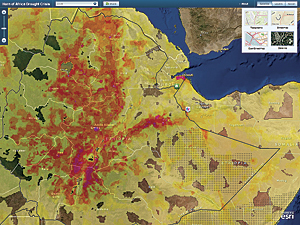 Esri's cloud service ArcGIS.com provides a virtual space for the map group Horn of Africa Drought/Famine Crisis Response to share data layers for this map that users can consume. These group members have created other maps for famine projection and agriculture land status. See the Horn of Africa Drought Crisis map.